Citycamp Manchester took place on 14th and 15th October at the Friends Meeting House. With the very broad theme of “making Manchester a more sustainable and resilient city”, we hoped that the series of talks, workshops and openspace sessions would encourage collaboration and inspire some new initiatives. In the plenary sessions, Neil McInroy from the Centre for Local Economic Strategies (CLES) and Paul Clarke from Incredible Edible Todmorden talked about the challenges that cities such as Manchester face with both economic and environmental challenges ahead. Both speakers entertained us with some possible solutions, and both emphasised the importance of linking our cities to nature through city farms and growing initiatives. Our programme of workshops highlighted some of Manchester’s existing initiatives – such as Moss Cider, FC United, Carbon Co-op and a project looking at allotments and opendata. 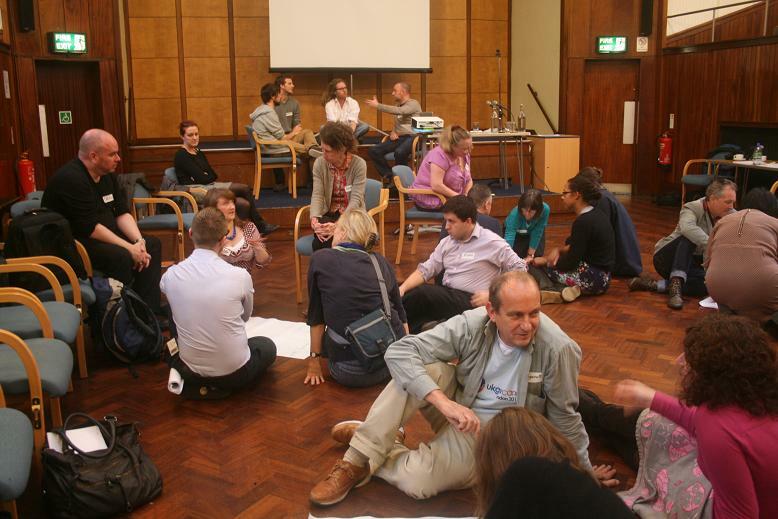 However, Citycamp was never about just listening – it was always about action, and creating something new. The openspace sessions, or focussed discussions, were all about helping people problem-solve issues and develop their ideas. They covered a range of topics including: Developing a Geek Youth Club, Bringing rickshaws to Manchester as a self-sustaining enterprise, finding every apple, mapping Manchester, and exploring how communities could be persuaded to engage more with local democracy. A Chorlton ‘pop-up farm’ growing project, inspired by Incredible Edible, and initiated at Citycamp has already received £750 funding and will start with a simple food-growing project within one of Manchester’s schools. Although we’re not sure whether there will be a second Citycamp Manchester, there are plans afoot for some of the team to facilitate one-off focussed discussions to assist people with idea development and problem-solving particular issues. Watch this space. This entry was posted in Event reports and tagged citycamp manchester, CLES, Incredible Edible Todmorden. Bookmark the permalink.